Hooray for Ina! 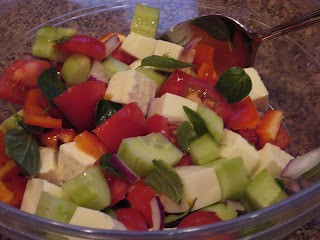 This week, we made Panzanella Salad that Melissa chose. Sabrina here: I didn't like it, but it was a neat salad to put together. I had fun cutting all the basil leaves of the plant. Although I felt bad because now there's nothing left. I hope it grows back. Alexander here: I didn't like it either, but at least I tried it. But I really liked cutting up all the vegetables. I'm getting really good with the knife. Although my mom didn't take any pictures of me doing it - something about the camera battery. Coming up next time for the BB group - Butterflied Chicken! Glad that you two tried it! Sorry you didn't like it though. bummer both of you didn't like it but at least it was fun to make! It's bad you both didn't like it, but at least you enjoyed making it! At least you tried it; it's definitely not very kid friendly but we old folks love it. Well it looks great! I give you guys credit for trying it!